When you’re a freelancer, finding the right app for organizing your freelance work isn’t easy. Many productivity, CRM or small business apps are too big or too small to meet the specific needs of freelancers. If you’re looking for an app that’s “just right,” you’ll find LightArrow Organizer to be the best fit to boost your freelance productivity and organization. It’s not a simple list or to-do list app, nor is it an expensive, long-term commitment. Freelancers and independent contractors need information for their business in a single glance. This is precisely what the LightArrow Dashboard does. Enjoy easy-to-read, accurate data at your fingertips. Customer Relationship Management is an important part of managing a freelance business, whether you’re in IT, design, multimedia, writing, translation or other disciplines. Better manage and secure clients by creating custom client forms and fields for specialized client management. Automatically log conversations. Set reminders to follow up with clients and potential clients. Complete project and task management keeps freelancers on task. Track freelance projects and their deadlines. Attach supporting information to projects, such as reminders, appointments, files, photos, expenses and more. Add participants and instantly communicate with this group of users. Managing email is important for freelancers’ productivity. Filter email from senders across email accounts, and narrow email search criteria by using specific keywords found in email messages. Be more efficient by converting email messages to actionable calendar items. Unify your calendars. An intuitively designed daily agenda and eight comprehensive calendar views keep freelancers on top of commitments and important meetings. 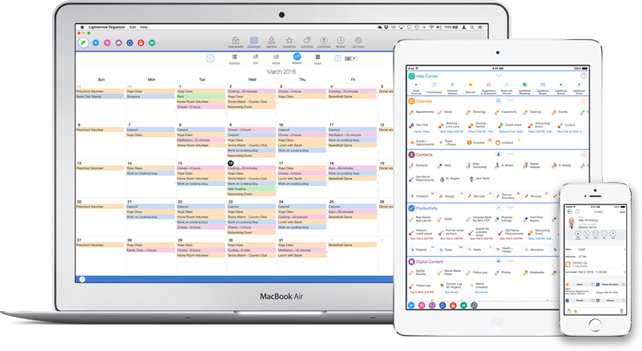 Manage a calendar of projects, deadlines and other daily commitments. LightArrow Organizer catalogs the assets freelancers lease or own, coordinates the trips they take, and helps them monitor their money through payments and expenses. Get a handle on deposits and total income by managing lists of transactions and tracking expenses. LightArrow apps are integrated with popular cloud services and applications, such as Dropbox™, Box™, OneDrive™, and Evernote®. Organize and view files, and associate files with other items in the app, which allows quick and easy retrieval of receipts, invoices and other documents. When working with a variety of clients, freelancers use several websites and need to recall a number of usernames and passwords. Use the secure password and private information manager with strong, military-grade 256-bit AES encryption to store and locate passwords, secret codes, private photos and other information with ease. Freelancers often collect digital content from different sources. Keeping this information organized is key to staying productive and informed. Bookmark things you find, make checklists and to do lists, take notes, securely store passwords, and access online notes from your favorite cloud services such as Evernote® and ToodleDo®. LightArrow Organizer’s Inboxes combines information feeds from email, social media and the web and also lets freelancers convert this information to activities, such as tasks. Save hours of switching from social media apps and email to gather information that you need.